Distributed outlet extension cords are all about having an outlet exactly where you need it. Our multiple outlet extension cords from Century Wire have an outlet spaced every ten feet-four along the cable and one at the end. 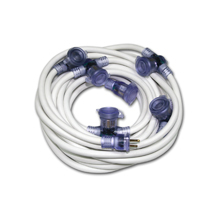 Each outlet has a cap that makes this extension cord great for outdoor use. It is made of stranded copper for easy coiling and the highly flexible jacket is designed to be easy to handle even in cold weather. Get power to tent lighting exactly where you need it. Wire a conference room for multiple computers or display monitors. Wire an orchestra pit to accommodate multiple stand lights. Wire onstage back lines to provide power for every amplifier and keyboards.